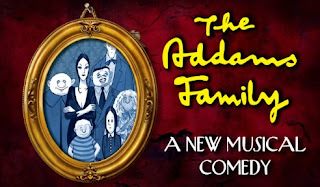 Putnam County Playhouse: Addams Family Auditions at Putnam County Playhouse! Addams Family Auditions at Putnam County Playhouse! The third show of our "Season of Laughs" is the musical comedy The Addams Family. It will be produced August 10 – 12 and 16 – 19. Director Ric McFadden will have two sessions of auditions for all roles in the show. The first session will be Sunday, June 4 at 3 p.m. to be followed by a second session on Monday, June 5, at 7 p.m. Both sessions will be held on the Main Stage at the Hazel Day Longden Theatre. The characters are the same as you might remember: Gomez, Morticia, Wednesday, Pugsley, Lurch, Uncle Fester, and Granny. This time around, the unsuspecting Beinecke family has been added including parents Mal & Alice and son, Lucas. The show is very reminiscent of the original television series you may have seen. The plot revolves around Wednesday who has fallen in love with Lucas, a normal" boy. A dinner at the Addams House is planned where the families will meet for the first time. Wednesday confides in her father Gomez, that in fact, she and Lucas are already engaged. Gomez must hide the information from his wife Morticia. The dinner ensues with much hilarity and fun for the audience. Auditions will include singing (16 to 24 measures please), reading from the script, and dancing. Prospective cast members should attend either audition date but not both. Characters include: Wednesday Addams..(teen/young adult); Gomez Addams (40 – 50); Morticia Addams (40 – 50); Alice Beinecke (40-50); Fester Addams(30-50); Pugsley Addams (8-13) tenor/boys' unchanged voice; Mal Beinecke (40-50); Lucas Beinecke (teen/young adult); Grandma Addams (script age is over 100); Lurch (30-60) bass, Tall. Addams Ancestors (various ages) appear in most scenes throughout the show. For more information, check out www.putnamcountyplayhouse.com. We hope to see you at auditions this summer! The Addams Family is sponsored by First National Bank.